David Leonhardt from the New York Times interviewed President Obama earlier this month and asked him about his ideas for health care reform and what that would look like from the patien'ts perspective. They touched on comparative effectiveness research, and the importance of the doctor-patient relationship, but it really got interesting (for me anyway) near the end of the article. Buried was a great insight into the President's own experience with caring for relative at the end of life. LEONHARDT: Yes, where it’s $20,000 for an extra week of life. LEONHARDT: And it’s going to be hard for people who don’t have the option of paying for it. LEONHARDT: So how do you — how do we deal with it? THE PRESIDENT: Well, I think that there is going to have to be a conversation that is guided by doctors, scientists, ethicists****. And then there is going to have to be a very difficult democratic conversation that takes place. It is very difficult to imagine the country making those decisions just through the normal political channels. And that’s part of why you have to have some independent group that can give you guidance. It’s not determinative, but I think has to be able to give you some guidance. And that’s part of what I suspect you’ll see emerging out of the various health care conversations that are taking place on the Hill right now. **Was this the best informed consent? From the families perspective the answer is fairly obvious -> "Let's choose the option that does not result in a miserable quality of life." I know many in palliative care are familiar with this scenario since falls and strokes in the elderly can be poor prognostic signs in the absence of a rapid recovery. ***Hopefully with good palliative care services and a team approach with the orthopedic surgeon, there may have been a few intermediate options that balanced comfort regardless of the surgical approach. I know the NHPCO and the AAHPM are advocating for seats at the table when health care reform comes up. Palliative care needs to be well represented, but how do you see the role for palliative care principles in health care reform? It cannot just be a larger palliative care workforce, because we already have some difficulty filling the current and near-future workforce needs. What would you write to Obama, DeParle, and Sebelius? If we get a lot of good ideas here then we can submit them to the Palliative Care Coalition. More Pallimed grassroots coming right up! WBUR (a Boston public radio station) has produced and broadcast a multipart documentary on end of life care in the US (Quality of Death: End of Life Care in America - Inside Out), with a major focus on palliative care, and balancing life-extension with quality of life and cost. It lays these issues bare, and even talks about research into providing palliative care specialist services early in the course of a disease. One of the segments actually involves a patient talking about how grateful he was for a palliative doc to talk with him frankly about dying instead of continuing the cheerleading. Wow. And it talks about how frank discussions are important for improving end of life care, as opposed to advance directive documents. Wow Wow. Thanks to Dr. Suzana Makowski for alerting me to this. BMJ has two editorials debating whether hospice facilities in the UK should be exempt or not from blanket NHS guidelines on cardiopulmonary resuscitation (yes exempt; no not exempt). Much of the discussion is about specific details of the NHS guidelines, and the structure of hospice care is different in the UK than in the US of course (ie many of these patients would not be considered 'hospice' patients per se in the US model), but it's interesting reading nonetheless. Both editorials are written by palliative care clinicians; this is a debate internal to the palliative care community. The Yes folks' major argument is with the national guidelines which create an opt-out system: resuscitation should be attempted unless patients opt-out. They argue that for hospices it should be an opt-in system. The not exempt folks basically argue this: hospice care is supposed to be state of the art medical care and by claiming exclusivity hospices are distancing themselves too much from mainstream medicine. Basically it's an argument that the movement has been claiming that it should be part of routine, mainstream healthcare and it's not a time to begin claiming exclusivity, particularly given now that palliative care settings are now seeing patients earlier on in their illnesses. They also note that the guidelines say that if there is no realistic prospect of success then CPR shouldn't even be attempted. While we don't have national guidelines in the US, that is in fact a professional standard** here yet we all know that it is routinely ignored and very few people feel comfortable making a decision unilaterally at the time of an arrest if a patient has no prior do not resuscitate order. I can't imagine it's much different in the UK. Anyway - I'm curious as to what those of you who work in hospice facility settings think of this, and what your facility standards are, and how much of a real-life issue this is (or not) - responding to requests for CPR in otherwise dying patients in hospice facilities. **I'm ignoring New York state, the VA system, and local institutions and more talking about the broad professional-ethical consensus that physicians have the right to decline to provide medical care/interventions they judge as having no realistic therapeutic benefit for a patient whether it's an aortic valve replacement, chemotherapy, or CPR. Even in oncology centers where palliative care services exist, they are often underused. Only a limited proportion of patients with poorly controlled symptoms are referred for expert palliative care, and many patients are referred only very late in the history of their illness after having suffered from inadequately controlled physical or psychological symptoms for some time. There is compelling data to suggest that this problem is even more severe when the underlying malignancy is hematological in nature. The getting-over-it approach is to continue to actively work to reduce and debunk the misconceptions and stigma associated with the term palliative care. This has been the approach of the ASCO board, which has recently endorsed a new policy statement on palliative cancer care. They have, in a very deliberate process, lent strong endorsement to the WHO definition and terminology. They define palliative cancer care as 'The integration into cancer care of therapies to address the multiple issues that cause suffering for patients and their families and have an impact on the quality of their lives. Palliative cancer care aims to give patients and their families the capacity to realize their full potential, when their cancer is curable as well as when the end of life is near.' Rather than shirking from the term palliative care, they have thrown their weight and credibility behind it in a further effort to educate clinicians and consumers about palliative care and to reduce stigma associated with the term. They want oncologists to confront stigma by communicating that the need for palliative care does not, in itself, conclude bad news; on the contrary, it infers the good news that optimizing quality of life is a priority of care for all patients. Kathleen Foley calls this 'getting real' about palliative care. So some good news; we'll see if there are long-term implications of this. Thanks to Dr. Bob Arnold for bringing this to my attention. Pain Medicine has a review of opioid-induced nausea and vomiting. It's an indepth review, heavy on the physiology, and is a good one for the teaching file especially those interested in 'deeper' reading (ie fellows). It makes the fascinating (and very tentative in its clinical relevance...ok probably clinically irrelevant) claim that higher doses of opioids may actually be preventive of nausea (long story, due to variable effects at the vomiting center vs. chemoreceptor trigger zone; I can't say that I've noticed this at all personally). The review promotes metoclopramide as the antiemetic of choice for opioid-related nausea, although this is all based in physiological and pharmacologic assumptions and not any real clinical data. A novel approach is to combine more than one analgesic principle in one molecule so that both mechanisms are pharmacologically engaged. This concept was realized in tapentadol, a compound purposely designed to combine two analgesic actions, mu opioid receptor agonist activity with norepinephrine reuptake inhibition. In this case, the analgesic effect is not reliant solely on agonist activity at the mu receptor that is also responsible for side effects. Data from preclinical studies indicate that the combination of these two analgesic actions is less likely to produce opioid-mediated side effects; for example, in one of the most commonly used emesis model species, the ferret, tapentadol may produce fewer episodes of retching and vomiting as compared with morphine . This suggests a potential therapeutic advantage over the currently available classical opioid analgesics, offering improved tolerability and equivalent analgesic efficacy. So yes, looking good in a ferret model...sigh. Clinical Journal of Pain has an industry-funded randomized, placebo controlled trial of extended release gabapentin for post-herpetic neuralgia. The ER gabapentin is delightfully described as 'gastric retentive,' which does in fact describe its mechanism: it 'swells' in the stomach and stays there for up to 8 hours. This was a 4-week study of ~150 patients with PHN who had at least 4/10 pain; their other analgesics (including adjuvants) were discontinued and they were randomized to 1800 mg once daily of ER gabapentin or divided as 600-1200 mg (there was a 2 week titration phase as patients got up to these doses, then were followed for another 2 weeks). Studies like this are very common in the industry funded research literature, and one assumes this was done with an aim to getting this novel formulation of gabapentin approved for the now generic drug. Patients were taken off all other analgesics and gabapentin is well established as a moderately effective treatment for PHN (moderately like all other treatments), so unless the new formulation was very poorly tolerated (which it wasn't) the results were likely to be positive (which they were). There's no reason to think this formulation offers anything new to our patients, except increased cost and I guess convenience. For me it's always interesting to see in these very clean (no other analgesics at baseline) placebo controlled trials just what the actual magnitude of benefit of the drug is. ER gabapentin was effective, modestly so. Both regimens decreased pain by about 2/10 points (twice daily a little more; which achieved statistical significance); placebo decreased by ~1/10 points. The number-needed-to-treat to achieve a 50% pain reduction in the twice daily gabapentin group compared to placebo was 6 after 4 weeks. CJP also has a small placebo controlled trial of tramadol for persistent neuropathic pain after spinal cord injury (started on 50 mg 3x a day, able to titrate to 400 mg daily). 20% of subjects were on concomitant opioids at the time of the study. Tramadol was (guess what?) modestly effective compared to placebo, although a high number of significant adverse effects occurred. What was most interesting to me was the breakdown of the global impression of change data as it is illustrative of a major clinical and research issue in pain management (and other disease states of course): about 2/3 of those on tramadol said they were the same or minimally improved; about 1/3 said they were much improved. This sort of finding, while not surprising, is one of the reasons one gets frustrated with a lot of pain research (it's not the researchers fault). Assuming for the sake of argument that this is a real effect/finding: what it means is that while most patients who you'd start on tramadol wouldn't benefit; there are a handful however who would benefit tremendously. That is of course what we see in clinical practice, and why particularly for complicated pain syndromes most of us cycle through a variety of different agents and drug classes, hoping one, eventually, works. And sometimes it does. To state this another way, while these studies of populations demonstrate some average benefit of a drug applied to a population, in reality (and especially for studies involving such highly variable and idiosyncratic syndromes like neuropathic pain syndromes) many patients don't benefit at all, a few are frankly hurt (all side effects, no benefit), and a few benefit a lot. Average it out, and the drug shows a 'statistically significant' benefit. The problem is that we have zero clue as to where an individual patient will fit into that. Our patients, in pain, leery of these drugs with terrifying package inserts, have to live through this while hoping we stumble blindly into the agent which happens to work decently for them (if any do). CJP also has a tidy review on the endocrine effects of opioids: teaching file/fellows. Pain has a review on the effectiveness of patient educational interventions for cancer pain management: not too many studies, 'heterogeneity,' some evidence pointing to such interventions can in fact improve analgesia ~1/10 points. A couple media pieces from the last couple weeks. A lawyer for the nursing home was consulted. He said in this case, Catherine's decision would not be euthanasia, which is illegal in Massachusetts, because no one would be injecting a drug to end her life. Instead, the oxygen level would be gradually turned down, while a morphine drip would keep Catherine comfortable and calm. She would simply be putting aside the technology that kept her tethered to life. Thanks to Dr. Jennifer Kapo for alerting us to this. The NYT blog 'The New Old Age' had a piece recently about the Coping With Cancer Study about the price of 'denial' with regards to suffering and medical costs at the end of life. While good, I have a quibble with the use of 'denial' to describe what the CWCS has found: they were measuring rates of having an EOL conversations, etc. (lower rates-->more costs, worse patient/bereavement outcomes to an extent). This is not necessarily 'denial' as it is popularly imagined; while that may be part of it, this may also be 'simply' a lack of planning (talking) about death due to clinician unwillingness, patient unwillingness, etc. 'Denial' per se may not have entered into it. That's a quibbling point, but I'm bringing it up as I kind of hate the term, find it imprecise, often used inaccurately and perjuratively against patients, and am actually looking for a decent, useful, working definition of it. Any thoughts? Thanks to Dr. Mamta Bhatnager for alerting us to this. What's missing however is that ADs, even when patients have them, have yet to be persuasively shown to actually improve EOL care, or even be honored, and while I think naming a health care power of attorney is a great thing, we've discussed on the blog before how what is documented in ADs are often difficult to interpret at life's end. 'I don't want tube feeds.' Neither do I, but does that mean never, ever, under any circumstances, even if your doctor thinks it might be part of a reasonable resorative care plan? Patients might write 'I want to be comfortable when I die...not have any heroics...not have my dying prolonged.' Again - who doesn't? Only a tiny fraction of patients would want anything else; the problem is doctors identifying that a patient is dying, and communicating this in a way such that the family understands, accepts, and feels comfortable making decisions based on that reality. If this doesn't happen, ADs aren't going to help much, and while I have the occasional family who presents an AD to me and says 'you have to stop doing this to my dad,' that's rare enough that my own suspicion is that this very rarity is why ADs haven't changed much. JAMA has a couple related articles which, while not palliative care specific, will likely resonate with many palliative clinicians. Peabody concluded this JAMA Classics article by pointing out that a physician who neglects the emotional life of a patient is as "unscientific as the investigator who neglects to control all the conditions that may affect his experiment." Ultimately Peabody reminded all physicians that "the secret of the care of the patient is in caring for the patient." It is sobering to consider that so much time has gone on and as a profession we still have little idea how to use the tools, the knowledge, the technology we bring to our frightened, suffering patients. The traditional research model that progresses from understanding disease biology to identifying effective therapies and ensuring patients receive those therapies is a long and laborious journey that often may do little to relieve patient distress and morbidity. The traditional translational research model could be coupled with a model that begins with patient systems [sic: I assume they mean symptoms - Drew], ensures that patients receive known effective therapies for their symptoms, conducts clinical research to find new therapies, and investigates disease biology. This model might begin with the development of systems to monitor and report patient symptoms, which could elicit patients' experiences via the Internet, electronic databases, or through the use of other technologies. This approach could lead to several areas of research including the design of interventions from known therapies to ameliorate those symptoms, the induction of clinical studies to fill knowledge gaps regarding effective therapies, and conduction of basic science research to fill knowledge gaps regarding disease biology as it relates to patient symptoms. Pain Treatment Topics has a review on the clinical use of opioid antagonists as analgesics/analgesic adjuncts (free full-text pdf here). This is a topic I've been following with interest the last few years and this review is the most accessible summary on the work that has been coming out about it. In short, there have been some tantalizing case series and small trials (as well as a large amount of non-clinical human and animal research) suggesting that opioid antagonists (e.g. naloxone and naltrexone), at tiny doses (not enough to cause withdrawal/reverse analgesia) MAYBE are some combination of: analgesic by themselves or beneficial adjuncts to patients on regular opioid agonists (can attenuate some side effects, reduce tolerance, attenuate opioid agonist hyperalgesic effects, etc.). This is aside from the ongoing work to develop combination opioid antagonist-agonist products which are less-easily abused (extended release oxycodone which releases a hefty dose of naltrexone when crushed, etc.). I had been aware of the theory and animal studies behind this for a while, but it wasn't until this case series in 2006 that I began wondering seriously if this was a line of inquiry which might lead to significant clinical benefit to our patients. I still am not sure of course; but this review seems to me a good argument for seriously investigating this in decent-sized human trials. I am not sure if this is being considered or not. My own perspective on this is that, at least for cancer pain, the good news is that a large majority of patients (85-95% - this is my own clinical gestalt) can receive adequate analgesia with tolerable side effects, despite progressive cancer, with the relatively straight-forward, judicious use of the typical opioids and other analgesics we have available to us. That leaves however the 'unlucky 5%' (or whatever fraction) for whom all the usual moves (escalation, rotation, try different route, use down-the-line adjuvants, etc.) don't work: persistent intolerable side effects, hyperalgesia and/or persistent tolerance to the analgesic effects of opioids. It's this group of patients (whom I assume get concentrated in palliative care environments as they require specialist level help with pain management) for whom these interventions, if they actually work, might be particularly helpful. It might however make the research more difficult however: if most people do just fine, it makes it more difficult to demonstrate benefit, as well as there being multiple reasons individuals don't do 'just fine,' etc. etc. So we'll see. Is anyone using opioid antagnoists clinically for these reasons? Please tell. I arrived at her house late in the afternoon. Her husband and son were waiting at the doorstep, looking distressed, with tearful eyes. I went to her room on the first floor. She was lying in bed, receiving an intravenous infusion. She welcomed me with a big smile and said, "Doctor, do you believe this chemotherapy will work?" At first I thought she was confused, but then her sister whispered to me, "It's only folic acid in normal saline, but she believes it's chemotherapy." Not really knowing what to do, and almost against my will, I could not help saying, "I hope so." Two days later, her sister informed me that she had died quietly, in a drowsy state. "She was peaceful." To look at it another way, the patient deferred decision making as well as informational control to her family who as far as you can tell from the case description made wise, patient-centered, and compassionate decisions for her (ignoring for the time being whether one thinks actively deceiving the patient is moral). That is, the patient didn't particularly need to know what was going on, insofar as she had ceded control of her care to her family. One gets the sense that she deliberately 'closed her eyes' to what was going on, turned away as she drifted away, and let her family do it all. This is not a situation in which a refusal to talk about 'the truth' was occurring in a context of requesting unreasonable treatments. 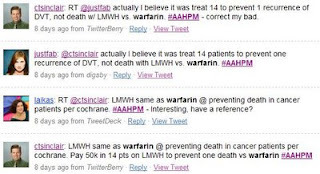 I personally think some collusion like this can be the right thing to do, and in fact I think we all collude to withhold the bare truth from our patients regularly, and my own standard is that it all depends on what the patient wants to know (I ask) and needs to know in order to make whatever decisions need to be made. This is an extreme example of that, which doesn't change the fact that most patients, most of the time, want to know most things (Big Picture-wise), and are often grateful to hear it as it often hasn't been stated in a clear, understandable way. Pain has a paper about 'acceptance of pain' in cancer patients. They define 'pain acceptance' as: "the acknowledgement of pain without directing all efforts toward controlling it and refocusing efforts toward living a fulfilling life in spite of chronic pain." The study involves ~130 patients at a single Canadian cancer center (mean age 55; ~60% saying that their worst pain during the day was moderate-to-severe) who answered a whole bunch of questions about pain, quality of life, etc. They were also administered a pain acceptance scale which looked at activity engagement and pain willingness: "Activity Engagement measures the degree to which people with pain participate in life activities despite pain, and Pain Willingness measures willingness to experience pain without controlling it." This is the first study to show that greater acceptance of cancer pain is related to better psychological wellbeing. ...This study is also the first to show a relationship between parental status and acceptance of cancer pain. Specifically, parents with children at home reported lower willingness to experience pain than those without children. Acceptance of cancer pain was unrelated to pain duration, severity, and qualities, subjective social and relational factors, and age and gender. This study adds to our growing understanding of biopsychosocial factors in cancer pain and its impact and suggests that acceptance may play a role in patients’ adaptation to living with ongoing disease-related pain. We found that Activity Engagement was related to lower severity of depressive symptoms, and Pain Willingness was related to less pain catastrophizing. [H]ealth care providers sensitively communicate with patients about their prognosis and promote shared decision making to the extent that patients want to be involved; patients are educated about what they can expect during treatment, what to monitor, and who they can turn to for help; patients are provided with their desired emotional support and symptom amelioration; patients are treated with respect; cancer treatment sessions support comfort, ensure privacy, and promote healing; and care is coordinated among health care providers. As you can see there is a particular focus on communication - the tool asks numerous questions about how communication went - and notably the area which patients most consistently identified need for improvement (over half) was regarding communication (as opposed to, say, how things went in the chemo-room, etc.). The validation data (internal consistency, etc.) looked promising. Since my mother's death, I have been in grief. I walk down the street; I answer my phone; I brush my hair; I manage, at times, to look like a normal person, but I don't feel normal. She researches the medical literature, and thankfully finds the Yale study on Kubler-Ross stages/states from 2007. She makes many literature references including CS Lewis' A Grief Observed, Shakespeare's Hamlet, Sogyal Rinpoche's The Tibetan Book of Living and Dying, multiple poets and Joan Didion's The Year of Magical Thinking. She even talked with Holly Prigerson, the lead researcher on the Coping with Cancer study. This series is a must read for anyone in hospice and palliative care. Use each article as a discussion point at your next team meeting. Feel free to post other ways to use these articles in the comments. I loved you, helplessly, with a boundless tongue-tied love. And death doesn't prevent me from loving you. in my opinion you aren't dead. Thanks to all the people who emailed, called, and talked about the FDA's memo on stopping production of highly concentrated liquid morphine and other opioids. The comments came very quickly after the post went up on Pallimed on April 1st. As Drew noted, the FDA reversed the decision. From listening to the teleconference, I thought Dennis Throckmorton and the FDA were immensely conciliatory and apologetic in not discussing the matter with the hospice and palliative medicine community. I imagine there will be many more discussions in the future now that they realize we are here. View more presentations from ctsinclair. Pallimed readers were an important part of the leverage of the social network. Could this have happened without Pallimed, Twitter or Facebook? Of course. But an argument could be made for developing more robust and dynamic social networks in our field to help spread the messages important to our field. Do you have any stories about how you heard or passed on information from the FDA memo reversal? Lancet has the results of a multi-national randomized controlled trial of balloon kyphoplasty for vertebral compression fractures. This was an industry-funded trial of ~300 patients with 1-3 acute or subacute (less than 3 months old - mean was 6 weeks old), painful (4/10 or greater) VCFs who were randomized to KP or medical management/routine supportive care (meds, braces, therapy, etc.). They followed patients for 12 months, although the primary outcome was changes in the SF-36 quality of life scale at 30 days. Intention to treat analysis was used; as far as I can tell no one (not even the researchers administering the follow up surveys) was blinded. Health-related quality of life was improved at 1 month (statistically and likely clinically significant) in the KP group; this had mostly attenuated by a year (although remained statistically significant). Pain improved markedly in the KP group in the short term: from (median) 7/10 before the procedure to ~3.5/10 immediately afterwards. By one month the difference was about 2/10 points between groups (3.5/10 vs. 5.5/10); this gap slowly closed over the year and was about 1/10 points at 12 months (3/10 vs. 4/10). At one month 65% of control group patients were taking opioids vs. 45% in the KP group; this difference was gone by 1 year (both ~30%). There was one serious procedure related adverse event (hematoma); 27% had cement extravasation (all aysmptomatic). Overall, rates of adverse events were similar. Cancer/myeloma-related VCF patients were included in the study although only 1% of the subjects had these so one cannot draw any conclusions specifically about cancer-related VCFs. These is the best study done on KP and the results are supportive of KP: rapid and marked pain relief that endures for a year although over months, as presumably the non-KP patients' fractures heal, the benefits attenuate. The benefits in overall health-related QOL are less pronounced, but they're there at least for a few months. It is also reassuring that patients well over a month out from their fractures appear to get good benefit, although they did not present any analysis of whether time-from-fracture was related to the magnitude of the benefit. The biggest concern for me was the lack of blinding; not even in those administering the survey instruments. Patient-blinding is difficult with interventions like these (although it has been done, e.g. at Mayo in the use of sham-procedures in their controlled trial of celiac plexus blocks) of course, but blinding of those doing the analyses and data collection is ideal. In addition, this does not answer the question of whether simple vertebroplasty (which doesn't use balloons) is as efficacious as the more-expensive KP. A few from recent JAMAs. Most notably is a brief, chatty commentary about words not to use with seriously ill patients. It discusses the inaccuracy and potential damage done by the phrases: 'nothing more to do,' 'would you like us to do everything possible?,' 'stop the machines,' and 'withdrawal of care.' Besides describing why these phrases are confusing and unhelpful, the commentary also offers alternatives (e.g. 'I wish there were something we could do to cure your illness.... Let's focus on what we can do to help you."). A good one for the teaching file. There is also a brief new story noting that the FDA is warning that patients should remove transdermal patches prior to receiving an MRI. Apparently some patches have a small amount of metal and can cause burns. I've never heard of this or seen this; the article doesn't specify which patches (e.g. transdermal fentanyl). Any readers know any more about this, particularly with regards to 'palliative'-type drugs? There is another news story about the FDA opioid REMS program (see here & here), in the context of the growth of prescription drug abuse. Reading the article I was struck by how little we know at this point as to what the problems really are: is the increase in opioid deaths and complications due to physician behavior (careless prescribing etc. - the article gives examples about opioid naive patients being given transdermal fentanyl prescriptions - this is a problem to be sure, but is physician behavior like this really at the root of the problems?) vs. criminal activity via pharmacy thefts and diversion vs. drug companies vs. etc. etc. I am not convinced physician behavior is a major contributor to the problem - show me the evidence. And if it is not, then focusing on physician education (ie mandating pain training in order to prescribe) will likely not solve things and will mostly punish patients in pain who can no longer find clinicians to care for them. FDA is rescinding the removal of unapproved 20 mg/cc Morphine products—they groveled that they had completely missed the boat about this product. No other changes to the order to cease manufactuer and distribution of other opioids. Well, one step in the right direction. AAHPM and other organizations have been quite vocal about this and I'm assuming there will be further announces about what was learned today. The first time I heard about the FDA's Risk Evaluation and Mitigation Strategy (REMS) program for opioids was during Paice's closing plenary at the AAHPM in March 2009. So when REMS for opioid was a headline on the front page of Pain Medicine News (reg required), it immediately grabbed my attention. After last week's announcement by the FDA regarding the loss of different concentrations of opioids, this seems to be the year of increased opioid scrutiny. The REMS program has already been implemented with Accutane and Thalidomide and is apparently developed and implemented by the pharmaceutical manufacturers with oversight from the FDA. The Pain Medicine News article states the FDA has already met with key stakeholders to discuss the program, but it does not say if palliative medicine organizations or clinicians were involved. I wonder if they only included pain specialists/anesthesiologists in addition to pharmaceutical companies. The main focus will be on 24 extended release products, as opposed to the immediate release program. There are quotes in the article that the FDA is concerned the general public and practioners are not aware of the risks of extended release opioids. Frankly many patients and family members I talk to are very reluctant to take opioids, and I am sure many hospice or palliative medicine professionals spend a great deal of time educating others that opioids can have benefits that outweigh the manageable risks. I have told students and residents rotating through that 'opioids need to be respected not feared.' With more experience and good training prescribers can become more confident, safe and skilled in opioid prescriptions. My fear with the FDA REMS program is that it may have an unintended consequence of limiting the number of prescribers who will prescribe opioids, and much of this may fall on the pain specialists or palliative medicine specialists. And then you put the onus of lawyers suing for not adequately controlling pain, and we have a classic Catch-22. No mention in the article about an exemption or how this may impact hospice patients. I am not sure how I would feel about a complete exemption for hospice patients as this could actually cause different problems, and if hospice patients and opioids in homes are part of the diversion problem we should not be afraid to be part of a well thought out solution that does not limit access for patients needing pain relief. What do you think about REMS? Should hospice and palliative medicine work to define standards for opioid education before someone else defines them for us? More noise is being made in the last few weeks online regarding the "Hospice Cap", the mechanism by Medicare to cap spending on hospice as an aggregate. If you have not heard about the Hospice Cap yet, Les Morgan interviews Larry Beresford about the Hospice Cap on the Growth House site (around 30mins). Larry also posted a summary on his blog. Both are fairly balanced in approaching the views of both sides. The National Alliance for Hospice Access is the main organizing group for repealing/reforming the Hospice Cap. The main public relations approach is to use the Cap as a foil, that is preventing hospices from caring for patients. On Twitter, a few accounts have been set up just for this PR reason to reiterate that the Hospice Cap is bankrupting 'hospice' as a whole and as individual hospices. So there is a real push to educate the public about the hospice cap. The main debate between hospices seems to be between hospices who hit the cap vs. hospices who do not hit the cap. This has the potential to really set hospice agencies against each other regionally and nationally. I do not think the NHPCO or AAHPM or HPNA have weighed in on this issue yet. What do you know/think about the hospice cap? Is this a problem for a few hospices or the field as a greater whole? While the followers on Twitter may have redundancy (i.e. @doclake follows me and @johnmulder), redundancy of connections is actually good (to a degree) to ensure everyone in a group 'knows' the same thing. Self-Correcting: A particular exchange between myself and @justfab demonstrated the power of networks to self-correct or heal. While this was only one example, with a larger social network any incorrect fact could be rapidly corrected (or perpetuated as well). I thought this was pretty impressive to occur in just under 2.5 hours. Wikipedia has accomplished rapid error checking and vandalism correction in the same way but with a humongous social network. Augmenting Face to Face Discussions: I only had a handful of face to face discussions that were directly related to any particular post I did, but in general people were talking about Twitter as a new tool for communication within our specialty and I see that as a good thing. I gave many Twitter lessons from my Blackberry or laptop throughout the conference. I found the most effective way to understand Twitter is to put it within the context of real world/face-to-face relationships. Developing a user base comfortable with Twitter: There was a large growth in hospice & palliative medicine (HPM) professionals using Twitter in the few weeks leading up to the Annual Assembly. But many users who signed up for Twitter were not proficient users by the time the conference rolled around. This was evident from the varying degrees of adoption with only 30 out of an approximate 200 HPM Tweeple posting tweets. If you plan to use Twitter successfully at an upcoming meeting or anytime in the future, make sure when people sign up they understand how to effectively participate. Developing a higher degree of interconnectedness: Just adding an account to follow one or two people does not encourage conversations. Networks are more efficient at transmitting information when multiple users (nodes) have a high degree of interconnectedness. Overcoming health care professionals concern about public online communication: Twitter has not been widely adopted by health care professionals for many reasons: personal privacy, HIPPA concerns regardless if true or perceived, and thinking it is just another form of email. More work should be done to educate health care workers about how to protect one's identity online and appropriate etiquette as well as addressing legal and ethical concerns for health care professionals. Overall I would say this was a successful experiment. But as with any experiment more work needs to be done! Tom recently posted on another major publication from the Coping With Cancer Study. Psycho-Oncology, a couple months back, also published a CWC analysis that I overlooked until recently - looking into whether rates of psychological illness increase as cancer patients approach death. (See prior posts for descriptions of how the CWCS was done). In this analysis of ~280 patients, they compared baseline assessments (of, among other thing, psychiatric symptoms) across groups of patients by time to death (groups were divided into months to death from the initial assessment, ie: 1-2-3-4-5-6-6+ months). This way, for instance, psychiatric morbidity could be compared between those patients who ended up dying within a couple months to those who lived 6 or more. This analysis is cross-sectional: patients weren't followed from the initial assessment with repeated assessments until death to see if mental illness/symptoms increased - instead those who 'happened' to die rapidly were compared with those who didn't. They found that rates of mental illness (major depression, PTSD, generalized anxiety disorder, panic disorder) were ~10% across all groups, regardless of time-to-death. Existential distress did seem to be increased in those closer to death, along with physical symptoms; but not actual rates of psychiatric illness. They suggest that it is perhaps physical limitations and symptoms which cause the existential distress, although curiously not 'diagnosable' psychiatric illness. This is good news overall of course, and should lead further support to the idea that depression is not 'normal' in (even advanced) cancer - and should not be accepted as such (as normal and therefore not worthy of intervention). Concluding 'Well I'd be depressed too if this was happening to me' is just wrong: you'd likely have episodes of sadness, grief, loss, longing but not a pervasive disturbance of mood and thought. Psycho-Oncology also has a review on existential concerns in cancer patients. It's a quick summary of the scope and nature of the research about this; not particularly practical/clinically oriented but an excellent summary/starting point for those interesting in the research (good one for the teaching file, particularly for fellows).